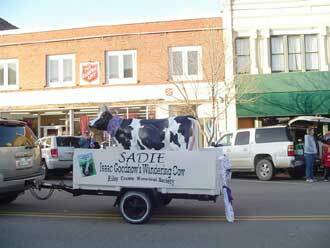 Sadie is a 200-pound aluminum "Holstein" purchased from Wagon Wheel Antiques and brought to Manhattan for the town's 150th birthday celebration. 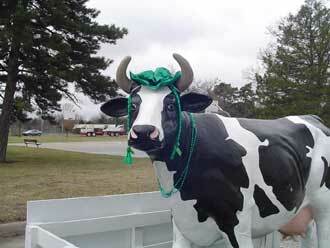 It all started when Darrell Westervelt, a member of the museum board, ran across an advertisement in "Grass and Grain" that the cow was for sale. 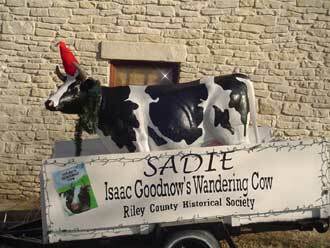 Officials thought she presented an opportunity to get children involved in the celebration through tales from the diary of Isaac Goodnow about his wandering cow. Goodnow was primarily known for helping to found Manhattan, Blumont College, and Kansas State University. There were several entries in his diary that referred to his restless bovine and her wandering ways. He once retrieved the stubborn animal from the yard of Sam Houston, another of Manhattan's founders, and once by moonlight near the Big Blue River. 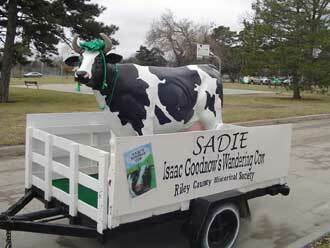 So to help celebrate, Sadie continued to wander the streets of modern-day Manhattan in her special trailer. Jan McIntosh has written a children's book about Sadie's adventures. It was illustrated by Diane Dollar and published by Riley County Historical Society in 2005. This is an interesting and informative way to tell the history of Manhattan, Kansas, and its founding fathers. It can be purchased from the Riley County Historical Museum.